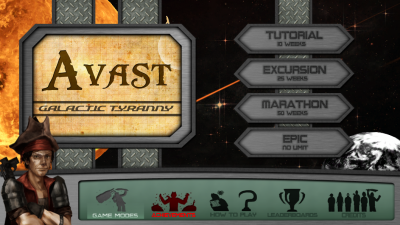 Avast is a turn based, tile driven strategy game. Pillage quadrants and accrue resources as you plunder your way across the galaxy. Manage risk versus reward, and try to be as efficient as possible. The goal of Avast is to accrue as much gold as possible in the time frame given. Each turn (“Week”) consists of a shopping phase and a resource allocation phase. Purchasing units is the backbone of your operation. 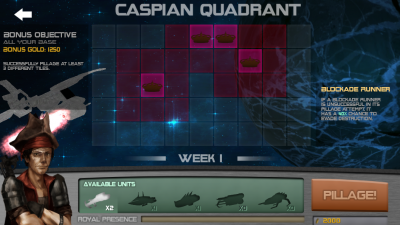 You can assign units to quadrant tiles in the allocation phase. Upgrades will greatly increase your efficiency in different areas. Your current unit will be highlighted in your dash. Mouse over quadrant tiles to view the battle scenario (% chance of winning, possible gold to pillage). Left click to commit and decommit quadrants. Unsuccessful attempts to pillage raise the royal presence meter, which will increase the strength of many of the enemy tiles. You should also balance trying to ‘bribe’ the presence meter, in order to lower it. Please note that this is best experienced at the 1280 by 720 resolution.